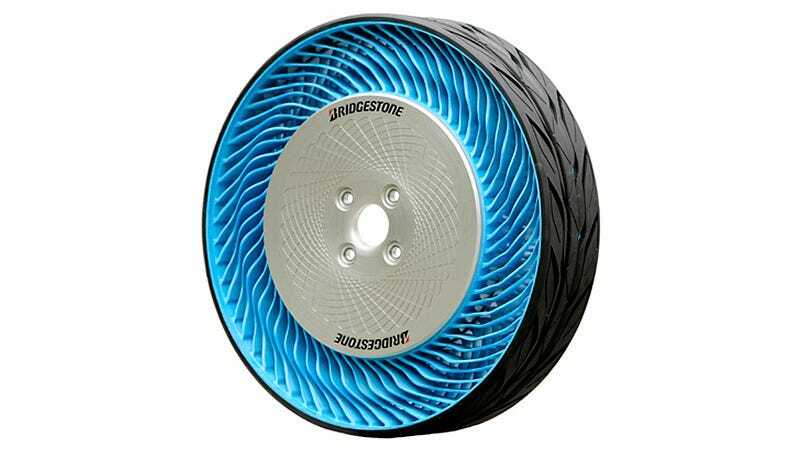 Bridgestone continues to taunt us with its wonderful airless tires that promise enhanced durability, minimal maintenance, and the ability to never go flat. Previously, the tiremaker was only demonstrating smaller versions of the wheel designed for golf carts and the like, but at the 2013 Tokyo Motor Show it's finally revealed a larger version bringing the innovative tires one step—or roll—closer to your car. The second-generation of Bridgestone's non-pneumatic tires has a larger diameter, improved load-bearing capabilities, and can handle speeds of up to almost 40 mph. So slapping a set on your family's minivan isn't going to happen just yet, but the tires can finally be used on vehicles larger than a go-kart.